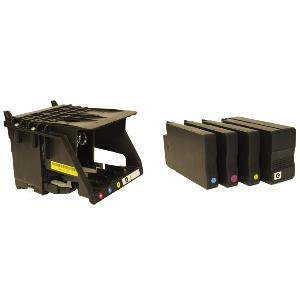 This is a genuine Primera semi-permanent printhead assembly for the Primera LX1000e and LX2000e colour label printer. The printhead comes complete with a set of "priming" cartridges which must be used when commissioning the printhead. #LIFE SPAN#This printhead is expected to last for a finite period of time. Typically it should last for at least 50 sets of ink cartridges, however this is not a guarantee. The printhead could last longer or shorter than this depending upon many environmental and usage factors. Printheads will not be replaced under warranty because they have not lasted for 50 sets of cartridges. Typically if your printer is printing labels containing a lot of white lines or obvious banding then your printhead may be wearing out and in need of replacement.